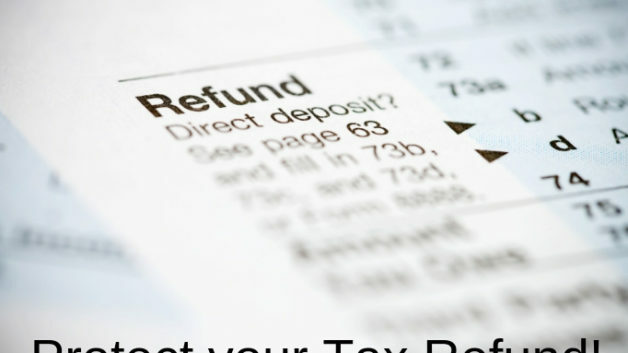 You are here: Home › News & Media › Protect your Tax Refund! An H&R Block advertisement was broadcast the other day that I thought was fantastic. They were emphasizing the billions of dollars that Americans receive annually in tax refunds, and they were saying that “tax season” should really be thought of as “tax REFUND season” and therefore something to celebrate rather than to dread. For many people, this is exactly correct. Many people use tax withholdings as a sort of forced savings plan – they over-withhold taxes from their paychecks throughout the year because they know that they’ll get a big refund come spring. Now, tax experts and accountants will tell you that this is actually a foolish thing to do because you are in essence giving the government an interest-free loan in the amount of your tax refund. Technically, they are correct. But, let me tell you a little secret – I do the same thing personally. The first year that I started my own practice, I got a huge shock when I did my tax return – I had to write a check for over $10,000 in taxes that I owed for that year. Talk about a punch to the gut! I vowed then to never, ever let that happen again. Plus, it may be financially “silly”, but I like the idea of getting a big tax refund back. It makes me look at tax season a little less reluctantly knowing that I’m going to get a nice tax refund. So, I thumb my nose at the tax experts myself. What you really have to watch out for, though, if you have some debts that are overdue, is losing your tax refund to a creditor. Creditors can sue you to get a judgment, then they can garnish your bank accounts after you deposit that hard-earned tax refund. I had that happen to a lady about 5 years ago – two days before she came to see me for the first time, she had her tax refund garnished from her bank account. Don’t let that happen to you. Also, there is some conventional wisdom “on the street” that if you file bankruptcy you will lose your tax refund. A good bankruptcy attorney will make sure that doesn’t happen and will give you options to avoid that outcome. We’ve been dealing with this issue for more than 20 years, so we are well versed at protecting our clients’ tax refunds to the maximum extent possible. It is extremely rare that one of our clients loses any portion of their tax refund and even then there are extenuating circumstances. We want you to keep every single dime of your tax refund. Come in for a free consultation with an attorney to learn more. We offer three conveniently located offices in the Kansas City area. Call 913-422-0909 to schedule your visit.